A few years ago, I attended a marketing conference designed to help physicians boost their visibility online, where I met several enthusiastic medical professionals. To this day, one interaction with a doctor stays with me. After I explained our goal of luring more customers to their website and to their offices, he retorted indignantly, “They’re not customers, they are patients.” And indeed, he was correct. Doctors serve patients in the most important commercial transaction there is: human healthcare. Advertising, money, and marketing metrics are not the focus in their industry. At one time, doctors didn’t advertise at all. From the Journal of Medical Ethics, January, 2006: For generations following the first American Medical Association (AMA) Code of Ethics in 1847, the relationship between doctors and advertising remained unambiguous—advertising was forbidden. In 1975, however, the Federal Trade Commission (FTC) accused the profession of “restraint of trade” and legally persuaded doctors to permit advertising amongst their clan. Today, almost every doctor has a website. Many use their sites to lure more patients, but some are interested only in having a place to post their credentials and contact information. Because websites like Angie’s List, Google, and even Yelp regularly post reviews for doctors, many see the potential benefit of having influence on their online presence and a place to post assurances of their legitimacy and qualifications to prospective patients. Email Marketing is a valuable tool for physicians when communicating with existing patients. It’s a great way to remind people of health information that’s currently making news, like the spread of a new disease. The sudden and concerning spread of Zika is just one example of an opportunity for physicians to notify patients of precautions and new information. However, email marketing can be used for simple administrative purposes as well, such as changes in office personnel. Patients are often interested in this information, especially the addition of a new doctor or nurse. Many doctors utilize email marketing to send regular communications or newsletters to their patients. 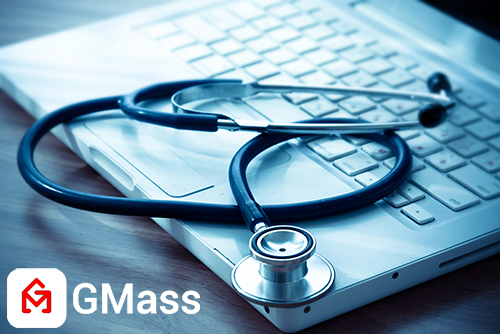 Why is GMass a great platform for medical professionals? GMass emails come directly from the sender’s Gmail account, via Gmail servers, resulting in much higher delivery rates than those from the other email marketing companies such as Constant Contact, Mail Chimp, and IContact. The email messages sent from those providers are often perceived by email filters as spam, and they do not reach the recipient’s inbox. GMass permits our users to inject (no pun intended) the patient’s name directly into the subject line and greeting, making the message more personal and private, something patients will appreciate. Of course, it is important for any healthcare professional to be aware of certain restraints when it comes to medical marketing, and they should always check to make sure they within boundaries of their state medical society, board, or any hospital guidelines. GMass has a YouTube channel with videos showing how to install and use our email marketing platform; subscribe or visit gmass.co for more details. Click here to sign up for GMass now. I want to start trial, I cannot.